AHDRA Headed to Great Bend, Kansas on September 23-24, 2011. The All Harley Drag Racing Association (AHDRA) has announced they will sanction a two-day regional style event at SRCA Drag Strip in Great Bend, Kansas on September 23-24, 2011. AHDRA has joined forces with Big Bend Bike Rally to bring the excitement of Harley Drag Racing to SRCA Drag Strip in Great Bend, Kansas for the 1st Annual Big Bend Bike Rally Drag Races on September 23-24, 2011. Fans will see Pro Dragsters, V-Rod Destroyers, Street Bikes and more on the track at SRCA Drag Strip. In addition to those classes, the 1st Annual Big Bend Bike Rally Drag Races will host the tire smoking, fire breathing, 230mph action of Nitro Harleys! On Friday, September 23rd, vendor set-up will be completed by 3:00 pm, with gates open to the public at 3:00 pm. Run What Ya Brung Test & Tune will begin at 7:00 pm and end at 11:00 pm, Gambler’s Race starts at 8:30pm, followed by live music featuring Second Nature from 8pm to midnight. FOX Kansas Beer Garden will be open from 6:00 pm to midnight (must be 18 years or older after 8pm). Thirteen classes of competition will take the track on Saturday, September 24th, with gates opening at 8:00 am, time trials at 10:00 am, followed by Nitro Bike Exhibitions at 11:00 am, Run What Ya Brung Racing from 2:00 pm to 3:00 pm, then Nitro Bike Exhibitions at 3:00 pm, followed by Eliminations. On Sunday, September 25th, gates open at 8:00 am; free breakfast will be served from 8:00 am until 10:00 am, followed by a Poker Run. In addition to the fast action on the track, the event will also include vendors, concessions, DynoJet Dynamometer, Harley Raffle Ticket Sales, Circle F Hauling Bike Games, Bike Show, Beer Garden, Battle of the Bands Competition, Becker Tire/Yokohama Burn-Out Contest, Award Ceremony/Cash and Harley Giveaways and Live Entertainment, by Retroactive. 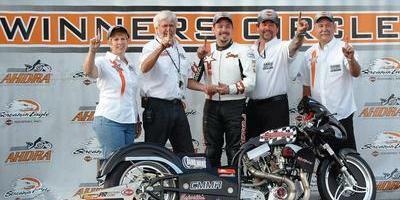 Tickets are available at the track and coming soon on Event Web Site, www.bigbendbikerally.com. Admission is $25.00 per person (kids 12 and under are free). Cover charge after 8:00pm is $5.00 per person (must be 18 or older). RV Parking and Tent Camping are available Friday and Saturday (no reservations are necessary) FREE for rally participants (no campfires allowed). For more information, contact 336-924-2095 or visit www.ahdra.com.